I came to Maui and my fibro flare followed. The airplane trip was pure hell. They cram people into teeny tiny seats that don’t move. I arrived on Sunday and have been very ill since. On the positive side, the pain attacks are subsiding. Today, I seem to resemble a human being. We’ve been coming to Maui for nearly 30 years. I love it here. We look out over the ocean from our lanai, where I’m taking it easy and recovering while I write this blog. I get to do a lot of people watching from the lanai. I wake up early every morning. I come out on the lanai, and it is still and quiet. The only sound is that of the surf on the beach. A bird here and there. Slowly, people arrive. A jogger shows up. 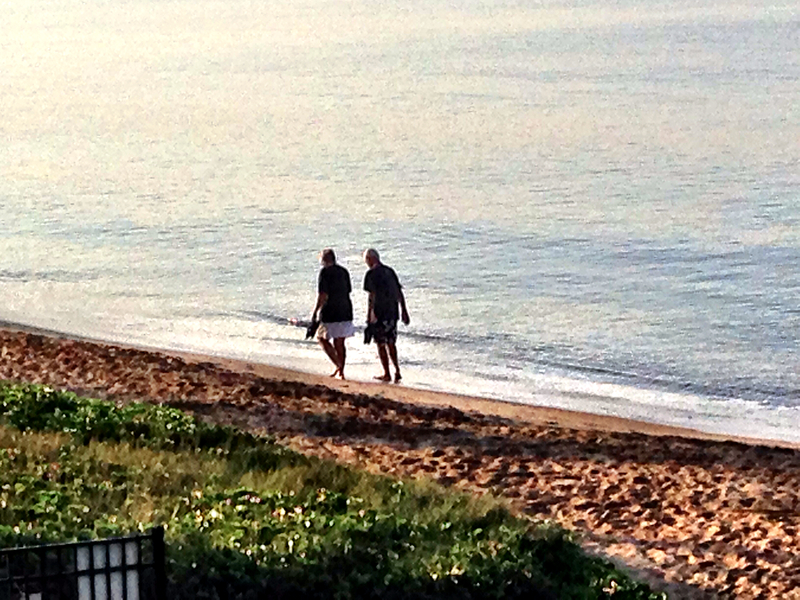 Then older couples start their morning beach walks. Later on, the children with their parents and grandparents are coming out. It’s fascinating to watch. I used to be able to wear those brief bikinis and strut around. Not now. What I’ve noticed in the last three years, is that most people do not have those fantastic bodies everyone seems to strive for. What I see is that there are as many kinds and shapes of bodies as there are people. I decided that I want to take a series of pictures called Bodies on the Beach. See if you find yours. I will try to post a picture most days. Remember, I’m on vacation in Maui, things are much slower here. I’m so calm and peaceful even if I did bring FM with me. The photo above is the first of the series. It is taken with Camera+ and enhanced in Afterlight on my iPhone. I highly recommend both of these products. ← I was Nominated, Now You’re Nominated! When I go away I usually put my fibromyalgia in a kennel. Boy, would I have loved to have done that! What a beautiful picture! I’m glad that the pain subsided and that you’re able to do some more things. Keep us posted with more beautiful pictures! I’m glad you liked the photo. Gentle hugs and Aloha.